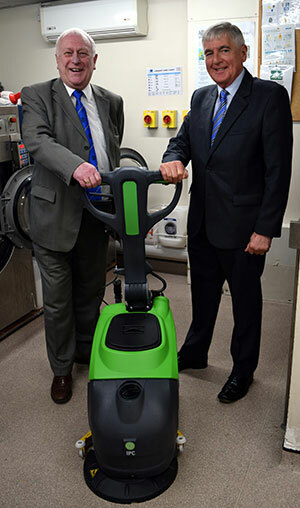 A generous donation made to St Catherine’s by the Leyland Group of Freemasons has contributed towards a useful new cleaning machine being purchased for use in the hospice’s inpatient unit. Jeff and Chris (right) look set to ‘clean up’ with the new floor cleaning equipment. The hospice has invested in new cleaning equipment for its floors, which prevents them from becoming slippery and speeds up the process for the hard-working housekeeping team. Leyland Group Charity Steward Jeff Lucas and Chairman of Leyland Group Chris Blackwell visited St Catherine’s to see at first-hand how the group’s £2,381 donation is benefitting patients. The donation was made up of £1,731 from the Masonic Charitable Foundation as part of its contributions to hospices across the country and £650 in donations from lodges within the group. Lorraine Charlesworth, director of community and income at St Catherine’s Hospice, said: “We’re so grateful for the wonderful, continued support of the Leyland Masonic Group, and this year’s donation has made a fantastic difference to our work as we’ve purchased a much-needed floor cleaning machine for the inpatient unit. It means that our floors can be cleaned quickly with minimum disruption, assisting in our infection prevention efforts, and the equipment polishes as well as cleans so it doesn’t become slippery. The award is just part of the total of £60,176 that has been gifted in direct and special project grants to hospices in West Lancashire in the past 12 months by local Freemasons. Pictured from left to right, are: Lorraine Charlesworth, Chris Blackwell, Jeff Lucas and two other members of the hospice fund raising team, Emily Bate and Emma Jacovelli. Prev:A second time in the chair of Harthill for Dave.